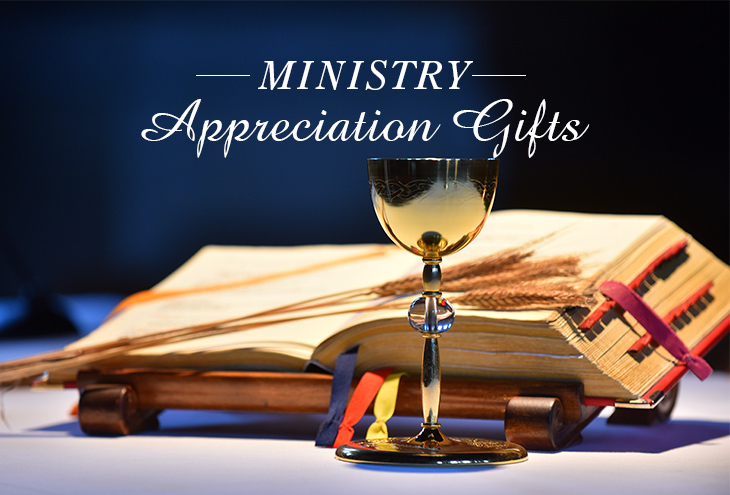 A token of appreciation for your pastor, chief administrator or minister of music is a fitting way to celebrate ministry appreciation, but remember, you don’t have to spend a lot of money to make a lasting impact. Consider the gift categories below before you head out to shop. Notes/Letters: It’s simple, it’s sweet and it’s the kind of gift that will make a memory. If you’re in charge of a ministry appreciation present, consider collecting cards, hand-written notes, letters and drawings from members of the congregation old and young. You can bind them in an album when you've got them all or even store them in an old-fashioned hat or letter box. Collage/Artwork: This gift idea works particularly well when kids are involved. Have Sunday classes or the youth group work on an art project a few weeks running, and when you have enough colorful paintings or textured designs, fashion them into a collage and laminate it for safe keeping. Nothing makes a pastor smile quite like the hard-work and faith of a congregation’s children. Performance: When appreciation day rolls around, instead of just handing over a gift, why not treat your honoree to a live performance? Have the choir sing a meaningful piece, organize the high-school youth group to act out a skit, have a talented musician write a special instrumental. The possibilities are endless and you can even record the special moment to preserve it forever. Photo Book: Pictures tell stories years after the book has been closed, so putting together a retrospective album is a wonderful way to honor someone in the ministry. You can put photos in a traditional album, arrange them in a photo tree or print a glossy book online. No matter the presentation, your honoree will be charmed. Bible Case: Who doesn’t love the idea of a sturdy leather or cleverly embroidered fabric case for their copy of the Good Book? Engraving a name or initials on these is always an option, but embroidery also enables to add a quote or piece of scripture. This leather cover by Christian Book is an excellent option for a man of the church. Pendant: The cross, a symbol that’s been associated with faith and spiritually for centuries, has always been lovely in pendant form. Metal crosses as well as wood and stone versions can be engraved with scripture identifiers or the name of a parish. Trax NYC offers this stainless steel pendant that’s absolutely prime for engraving. Wall hanging: The wall hanging is a gorgeous gift option because it can be interpreted a million different ways. You can choose something abstract and artistic, something with a heavy emphasis on nature or something more traditionally rooted in Christian history. This framed piece by Family Christian celebrates the many names of Jesus with beautiful artistry. 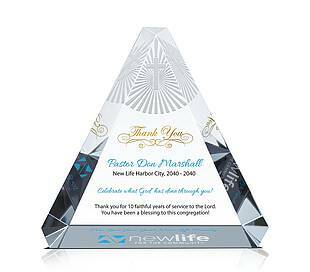 Crystal Plaques: The high quality material that is crystal is uniquely suited to convey a proper ministry gift. 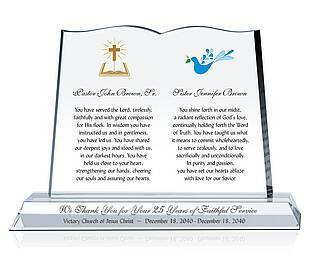 It is naturally reflective, polished to a high-shine and ideal for inscription. 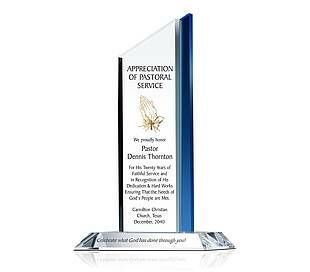 Crystal Central has an entire category of hand designed plaques and awards created for ministry appreciation. One example is pictured below.